There is a place Kevin and I love in Southern California that serves the best banana macadamia nut pancakes we’ve ever had. And they serve them with homemade coconut syrup. These are not those pancakes. 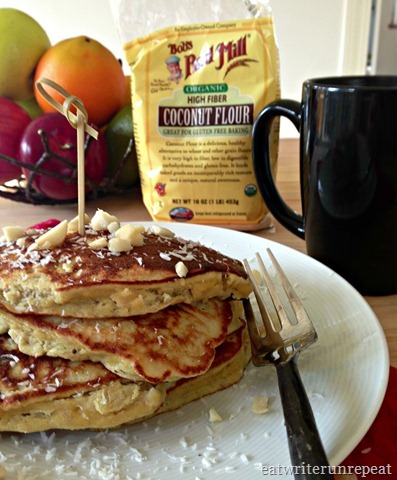 For one thing, they are grain and dairy free – two things that essentially make those pancakes. Also, I couldn’t figure out how to make homemade coconut syrup that could even come CLOSE to what they used…nor could I figure out how to make it without a ton of sugar. BUT. 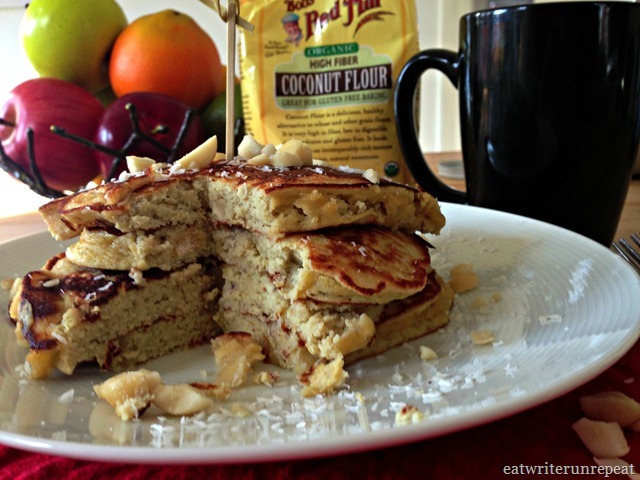 These pancakes are pretty darned good – and they are paleo approved! 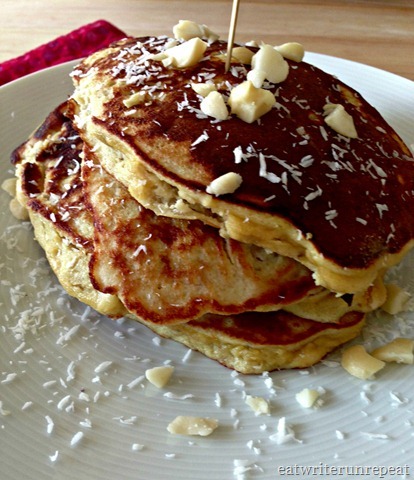 The batter is a super simple combination of eggs, mashed banana, macadamia nuts, and coconut flour – which gives these pancakes the fluff they need for me to consider them pancakes. Don’t get me wrong, I love our pumpkin pancakes with apple raisin compote, but there’s something about these thick, fluffy pancakes that just…comforts me. This is partly because I used to LOVE to make pancakes. 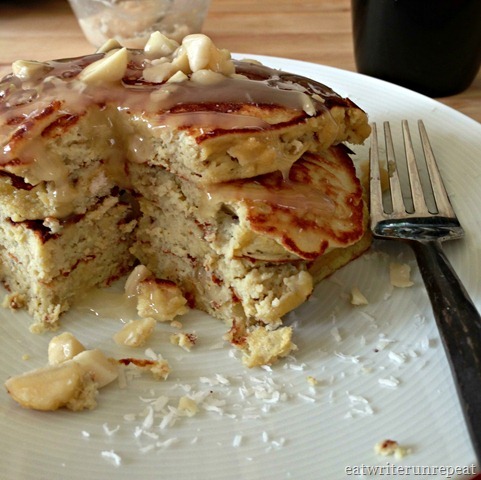 I’ve mentioned it before that pancakes are one of the things I miss most about eating paleo. They also used to be THE quintessential comfort food for me, particularly when I was living overseas. And while I view these as somewhat of a cheat paleo dish (coconut flour is still processed and still a flour and therefore not purely paleo, in my opinion), it’s a cheat I will definitely continue to make, particularly on weekends. These pancakes aren’t quite sweet enough to eat dry (although I did), but when drizzled with some raw honey, they were pretty much perfect. Combine all your ingredients to make a wet batter. On a hot griddle or in a hot (greased) skillet, pour out your pancakes (mine made 4, but I made them big) and let them cook fully on one side – about 3-4 minutes. Carefully (but quickly) flip them over and cook through, about another 3 minutes. Cover with raw honey (optional) and dig in! 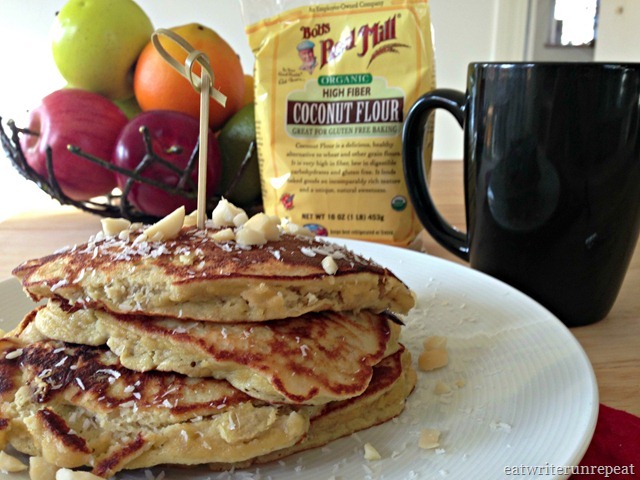 Posted on 5 November 2013 4 October 2015 by BeePosted in Breakfast, PaleoTagged banana, breakfast, coconut flour, macadamia nuts, paleo, pancakes.